At times we all feel anxious – it’s a very normal reaction to everyday events in our life. However, when these anxious feelings don’t go away, if they pop up for no apparent reason or if they stop you from doing the things you want to – you might have an anxiety disorder – and that is where we can help. Anxiety is not the same as ‘stress’ – stress normally comes and goes as the external factor causing it (be it a work, relationship or money problems for example) comes and goes. Anxiety is something that can persist whether or not the cause is clear to the individual. Approximately 8 million people in the UK have some form of an anxiety disorder1 and some consider it to be one of the most common psychiatric disorders in the World. People with an anxiety disorder may find they constantly feel a sense of threat or irrational fear and may be plagued with feelings of being unable to cope. Even when there are no obvious external factors, sufferers of anxiety can experience all the physical and emotional anxiety symptoms. These feelings can be overwhelming, stopping the individual from doing things or making them behave in unusual way. This can be hard for people who don’t have anxiety to understand – which can further isolate the person with anxiety. Patients often talk of being told to ‘stop worrying’, ‘think positively or ‘stop over thinking things’. These sorts of attitudes can lead to people with anxiety hiding how they feel and not asking for the support they need and deserve. Although it is important to address these negative thoughts, anxiety is an illness from which people cannot ‘snap’ out of – evidence based pharmacological and psychological treatments help alleviate these symptoms and offer recovery. 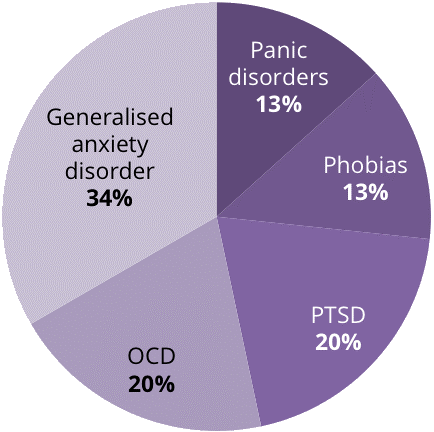 Percentage of anxiety disorders, broken into category. Understanding why some people develop anxiety disorders is complicated, but we know that people of all ages, genders and walks of life can be affected by the illness. Often anxiety disorders start early in life, between the ages of 10 and 25 – with average onset for most anxiety disorders at around 21 years of age2. Women are twice as likely as men to suffer with anxiety disorders. Anxiety disorders are commonly accompanied with another mental health conditions such as substance dependency or depression - in fact mixed depression and anxiety is the most common mental health disorder in the UK with 9.7% of the population having this diagnosis but only 15%3 of the people diagnosed with it receiving evidence based psychological and pharmacological treatment. 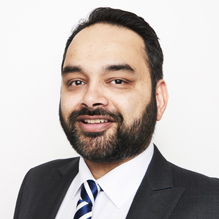 A qualified and experienced professional is the first step to knowing what is causing your anxiety and therefore finding the right treatment for you. The clinician was very non-judgemental and good at making me feel at ease when I was discussing things that are extremely personal. I was able to open up for the first time ever and because of that, found the right treatment plan for me. There are several types of anxiety recognised; whilst symptoms can be similar for all, the treatment plans may differ. Genetic predisposition: Some people may have a strong family history of anxiety disorders and may be predisposed due to their genetic makeup. Your risk is especially high if you have a parent with anxiety. Psychological: For some individuals, the physical symptoms of anxiety lead to the false belief that they have a serious physical illness, this leads to more worrying, leading to propagating their anxiety. Personality types: Busy, high-strung people with type A personalities have a greater risk of developing an anxiety disorder. Trauma: Certain forms of abuse, life threatening events and bullying are examples which could lead to development of anxiety. Drugs: Substances like amphetamines, cocaine, LSD, ecstasy and even high quantities of caffeine may predispose to development of anxiety. Co-existing mental health problems like depression make one more likely to get anxious as well. Medical conditions: Certain medical conditions like thyroid problems, premenstrual dysphoria and stress, irritable bowel syndrome, diabetes etc may also present with anxiety symptoms. As the causes of your anxiety can be multifaceted, understanding why you have anxiety is the first step to knowing how to treat it. Anxiety can feel like a spotlight in your mind shining on your deepest fears or worries at all times. If a person who struggles with an anxiety disorder turns to alcohol or another drug in an attempt to self-medicate or numb themselves to his or their psychological pain, the anxiety disorder symptoms may worsen and the person may develop additional problems related to their substance misuse.